The E-Series Display Timers combine the timing accuracy and precision of our most popular Elapsed Time Timing Systems with the crowd pleasing presentation of one of our Large LED Displays, all in one package. This Display Timer is a live counting timer displaying time to a thousandth of a second in digit height from 24in/61cm down to 8in/20cm models. When the vehicle 'breaks' the starting beam, the display starts counting. Breaking the finish line beam stops the elapsed timing. 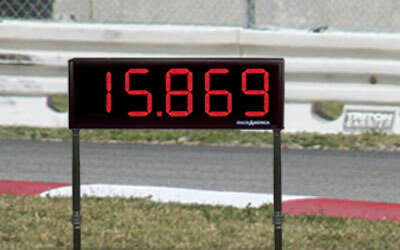 The LED display continuously displays the current time counting live at 0.001 second intervals and freezes the display when the finish line is crossed. Power can be supplied to the timer from any 12 volt DC power source or by using the optional 110VAC/230VAC Power Adapter. All hardwired E-Series Display Timers ship with track cables selected to connect to sensors at the start and finish line. Track cables run from the timer display to the start line and continue on to the finish line. To reset the time for the next run, a handheld pushbutton is included. What do I get when I order an E-series Display Timer? E-series Elapsed Time Diaplay Timers are LED Displays and timers all in one. The E-series designates an ET timer shipped with two battery powred Infrared Beam Emitters and two Infrared Track Sensors for the start and finish lines. Track cables are included selected to match the track and distances from the start to finish line. How does the timer operate? Press the handheld pushbutton to clear the timer. When the vehicle crosses the start line, the DIsplay Timer begins live counting. The time freezes when the vehicle crosses the finish line. Can I connect a PC and capture times? Yes, Counting Display Timers are compatible with data capture software by AXWare Systems. Click the RACE SOFTWARE button above to view the AXWareET software package.